Apple Mac users now have a really quick and convenient way of creating photo books thanks to a new app available in the Mac App Store. Motif is free to download and works within the desktop Photos application. It is currently available across North America and Europe, and there are plans to roll it out in Australia during the coming months. The program uses artificial intelligence to analyse your Photos collection and identify images that will be high-quality enough for printing. 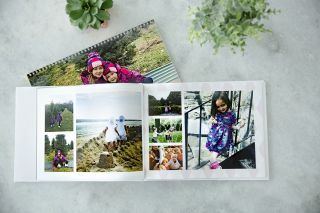 Creating a photo book – or photo calendars or photo cards, all printed on high-quality papers using rich inks – takes a matter of minutes. Photo books can be ordered with hard or soft covers. Photos may not be the go-to image management app for anyone serious about photography, but it works seamlessly with pictures taken on iOS devices and makes assembling collections to share with friends and family very straightforward. To receive this exclusive discount, Just enter DigitalCameraWORLD in the Promo Code field at the end of the in-app checkout process. This offer runs until 30 June 2019. Motif’s interface has been designed to be intuitive and easy to use. To test it out, we used Motif to create a 32-page 28 x 22cm hardback photo book of holiday photos taken on a Canon EOS 750D with an EF 28-70mm f2.8L II USM lens. Here's a tip if trying Motif for yourself: make a selection of images that's bigger than you need, as it's always best to have more to choose from when arranging the pages. And this is the finished result. Our hardback photo book took four business days to arrive, and came in a sturdy package. The book itself was inserted into a card sleeve and wrapped in plastic, so straight out of the box it's ideal for gifting. Inside, print quality is sharp throughout – even in cases of small smartphone images pushed larger than they would normally be – with good color rendition. The binding looks robust and the dust jacket is well-printed and fits snugly. … and had good color rendition. As a result, we’d have no hesitation gifting a Motif photo book to a friend or relative. And with Easter falling within the 30% discount window, Digital Camera World users can, too. Not a macOS user? Then read our guide to the best photo book services.